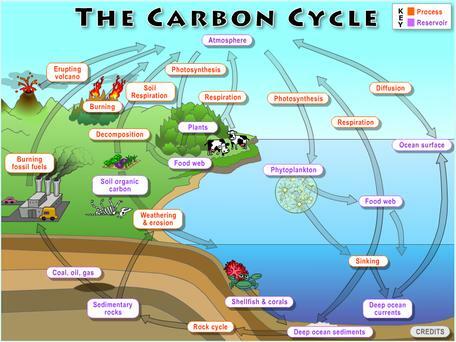 Why study the carbon cycle? Carbon is everywhere, in the oceans, in rocks and soils, in all forms of life, and in our atmosphere. Without carbon, life would not exist as we know it. The well-being and functioning of our planet depends on carbon and how it cycles through the Earth's systems. Carbon is constantly in the news. Have you heard of carbon dioxide and the greenhouse effect? The carbon cycle plays a key role in regulating Earth's global temperature and climate by controlling the amount of carbon dioxide in the atmosphere. The greenhouse effect itself is a naturally occurring phenomenon that makes Earth warm enough for life to exist. Without the greenhouse effect, Earth would be a much colder place. Carbon dioxide is an important greenhouse gas, because it helps Earth's atmosphere to retain heat generated from the Sun. But sometimes, too much of a good thing can have negative consequences. Too much carbon dioxide going into the atmosphere can lead to a planet that gets unnaturally hot. Since the industrial revolution in the 19th century, carbon dioxide in the atmosphere has risen by 30%. Scientists have shown that this increase in carbon dioxide is a result of human activities that have occurred over the last 150 years, including the burning of fossil fuels and deforestation. Since carbon seems to be connected to everything that matters to usour climate, our bodies, our ecosystems, the health of our planetit makes sense for us, scientists and non-scientists alike, to learn as much about carbon and carbon cycle as we can. Only then can we make sensible "carbon decisions" that will impact our future. This unit will introduce you to the basics of the carbon cycle. You will learn how the carbon cycle, climate and the abiotic and biotic components of the environment influence each other in many ways. You will learn how carbon moves throughout the different components of the carbon cycle and where carbon is stored in the Earth's system. Using case studies, NASA visualizations, current research, and interactives, you will explore how living things on land, in soils, and in our oceans regulate the carbon cycle. Because carbon, climate and the environment are tightly coupled, you will analyze the effect of carbon dioxide on the Earth's thermostat and our climate. Finally, you will seek possible solutions to a warming climate. How do the carbon cycle, climate and the environment influence each other? How does carbon move through the Geosphere and the Biosphere, in what forms and at what time and spatial scales? How is the carbon cycle interconnected with other biochemical cycles such as the nitrogen cycle? How does the carbon cycle regulate the temperature of Earth's atmosphere? Will carbon dioxide continue to rise, and if so, what can we do about it?